has been for a very long time. to keep up with it all. Better than the white man’s supermarket stuff. Breach of convenant. He digs early graves for us. In the aetiology of the ineffable. The wonder in the wordlessness, strong, true meaning. A mystery, some place where something spooky happened. And you just had to get the measure of nesting magpies. With the muck and mulch of clotted seaweed. The whiskers of the nostrils snickered at the stench of it all. It doesn’t matter much. It was good that he was there. Which had been ground for their good. Oddball to oddball, eyeball to eyeball. Are really our skeletons calling us to be free. Encompassing and enclosing the grace and the glory. And smiles with the gift of benediction. The windows’ pointillism paves the pilgrims’ paths. Is held high, wafer-light perhaps. Than I am to myself. 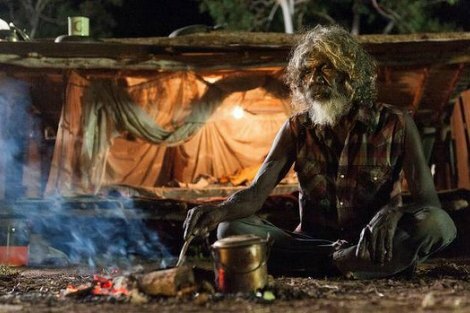 Image: From 'Charlie's Country' (2013), directed by Rolf de Heer. Superb poems make my day, thanks. How I love sweating in the gym. I frantically try to keep going on the treadmill to burn off as many of the naughty calories as I can. I can really feel myself spinning, almost like a spiritual awakening. My personal trainer is my motivator, and in many ways I feel like I have already won the battle of the bulge just by turning up.